Fashion Friday: Who wore it best? The April 2013 edition's of Glamour UK and Elle UK have something in common. Both of their cover girls have ended up wearing the same thing. January Jones is on the April cover of Glamour UK wearing a two-piece checkered print outfit from the Louis Vuitton Spring/Summer 2013 collection. 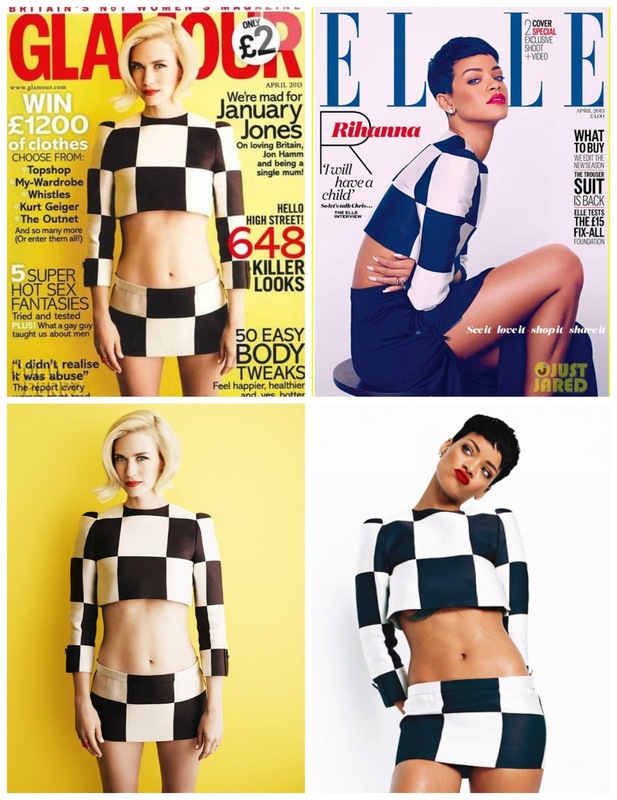 Rihanna happens to be wearing the same outfit on the April cover of Elle UK. The question is, who wore it best? I think they both look equally great in different ways. January Jones looks super mod and chic with her blonde bob, giving it a very 50's look - very fitting towards her Mad Men character. Rihanna on the other hand looks a lot more demure compared to her usual covers - she's a lot more covered up and none of her tattoo's are visible. And they're both rocking the red lips.